Over the last 20 years, Community Supported Agriculture (CSA) has become a popular way for consumers to buy seasonal food directly from local farms. 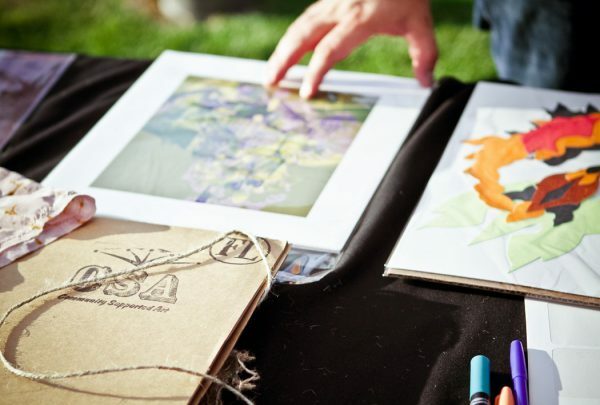 With the same buy-direct, buy-local spirit in mind, mnartists.org and Springboard for the Arts created a similar way to support local art, artists, and collectors. Community Supported Art is an exciting new model of art support and distribution for artists that establishes relationships with local collectors and patrons. How does it work? Nine selected artists receive a commission to create 50 “shares” for the program. Interested collectors will purchase a share from Springboard for the Arts and, in return, receive boxes or portfolios of locally produced artwork at intervals during the season. Featured works could include nearly anything. In the past, we’ve had specially-pressed vinyl 7-inch records, screen prints, series of small functional ceramics, photography, letterpress editions of a poem or short story, and 50 small original paintings. Each member share includes one piece from each of the nine CSA featured artist works over the season at pick-up events. For the Springboard CSA, shares are $300 each, come with studio visits and pickup parties, and are a great way to connect with local artists and art supporters. CSA is featured in the New York Times! “Rupam Sharan, a gastroenterologist, and his wife, Serena, heard about the program on public radio. “We’re interested in contemporary art, but haven’t started a collection yet,” Dr. Sharan said. “This is us getting our feet wet.”” Read the full story here. Want to replicate Community Supported Art in your community? Get the free toolkit! Community Supported Art has been replicated in over 60 communities across the United States and Canada since 2011. Find a CSA near you, or use the toolkit to start your own. Here is a map of currently active CSA programs as of 2018-19, with links to their websites. Here is a map of every CSA program that's run in the U.S. and Canada since 2011.